Feed the colony pollen substitute, which helps strengthen your hive and stimulates egg laying in the queen. Pollen substitute is available in a powdered mix from your bee supplier. This feeding can cease when you see bees bringing in their own pollen. That's all there is in the book on pollen sub. I've scoured all my books, the Internet, back issues of ABJ and Bee Culture, every bee supply catalog I have and, IMO, the subject is not well-covered. Just look at the MegaBee web site, and you'll see what I mean. You'll leave with more questions than when you arrived. If someone can tell me the differences between MegaBee, MegaBee Winter Patties, MegaBee Hydrid (and the many other subs out there), please, I'd love to know. so here's one looking into the feeder rim on the Warré hive. a grease patty and chunks of fondant. MegaBee is pollen substitute in powdered form. (No Honey-B-Healthy because this a dry product; all MegaBee patties contain HBH.) At 40% protein and only 4% carbs, this sub is for build-up any time but Winter. MegaBee Winter Patties are a low-protein/high carb formulation for adult bee maintenance. At ≠3% protein, it doesn't stimulate brood-rearing. This sub is good for emergency feeding throughout Winter and into early Spring. MegaBee Hybrid is the patty form of regular MegaBee pollen sub [i.e. : the powder mixed with sugar syrup (?? or HFCS) so it's a blend of protein and carbs]. I believe the protein is to stimulate brood production, the carbs are to feed the adult bees, and, as with all the patties, the Honey-B-Healthy is to boost colony health. I would suggest using this in early Spring and trying to time it so you have 2 or 3 of rounds of brood matured and ready for the first nectar flow. We RV travel and I am unable to keep bees. 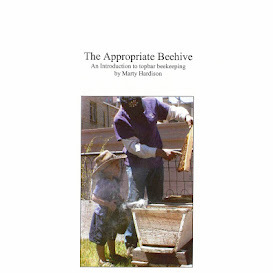 It is fun for me to read about other's keeping bees. I love the pictures.